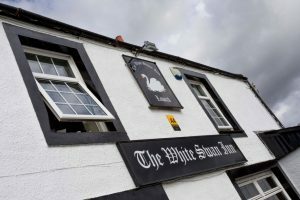 Hello - Situated in the historic village of Lowick and the gateway to the Cheviot Hills, the White Swan Inn boasts a picturesque countryside location with an on-site bar and restaurant, free Wi-Fi and private parking, there is no shortage of local attractions and historic landmarks nearby to visit and explore. The traditional market town of Berwick-upon-Tweed is a 20 minute drive away and contains many historical landmarks, such as the 18th Century Berwick Barracks and the Elizabethan Walls, Holy Island is also a scenic 20 minute drive and hosts a 16th Century Castle. Also nearby we have a wide variety of attractions to suite all, from beautiful costal walks to visiting Castles. There are six bedrooms available; each one is spacious and newly refurbished. All rooms boast an on-suite bathroom, TV/DVD player and tea/coffee making facilities. Families are welcome and we are pet friendly.